SINGAPORE - Jumping onto the Trump-Kim summit bandwagon is Royal Plaza on Scotts, which gave away 250 mini Trump-Kim burgers at noon on Tuesday (June 12). It will be giving away another 250 mini burgers at 6pm on a first-come-first-served basis. When The Straits Times reached the hotel at about 12.15pm, the food had been snapped up, with the chefs declaring that they had only the "last burger" left. 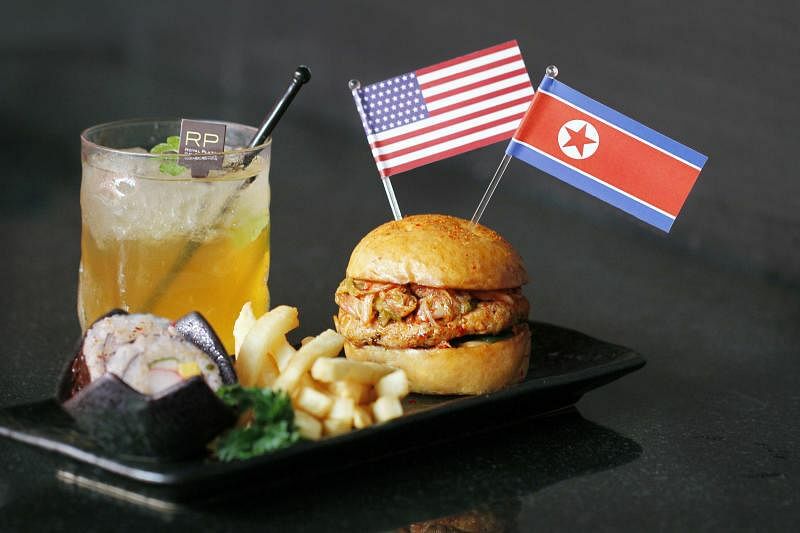 The hotel introduced a grilled Trump-Kim Burger ($12), comprising a minced chicken, seaweed and kimchi patty, served with Korean rice rolls and fries, as well as a Summit Iced Tea ($6), which is iced tea infused with Korean honey yuzu. The food, served at the Scotts Lounge, is on the menu till June 15. The giveaway was held outside the hotel, and there were about 10 people in the queue as the last burger was given away. The hotel's general manager Patrick Garcia Fiat told ST that the giveaway was held on the same day as the summit "to celebrate the summit and allow people to enjoy the friendship" while eating. "After all, Singaporeans love to eat," he added. He said that the Trump-Kim burger is made with the hopes that the summit can be as harmonious as the burger. A woman, who was enjoying the burger with her group of friends and who declined to be named, said that the burger was "very nice, with American and Korean taste". The Korean flavour is evident from the spiciness, she added. Mr Fiat, after watching the giveaway redeemed in "under 25 minutes", said the hotel will be adding the burger to its buffet as well. As for the historic summit, Mr Fiat hopes that "the foundations for the next meeting" can be laid out before they leave Singapore. "Just six months ago, nobody would have believed this but here we are," he said.